You’ll know if you follow me on Instagram @james_w_phillips that I spend a lot of time in Monaco, where the 28-degree daytime temperatures make effortless dressing a must. Summer can bring out the best, and the worst, in the British male – so I put it to you that it’s your duty to show the class and elegance that Great Britain is known for around the world! Number one – throw away your three-quarter length cargo shorts. I touched on this last summer in my column so I hope you’ve been taking note! These went out in the ’90s and have no place on the Côte D’Azur (or anywhere else come to that, other than maybe Benidorm). Shorts should be smart, fitted chino or linen – and wear flip flops with caution, if at all. Personally, I always opt for a suede loafer. Think before you choose linen. It looks perfect in the shop, but after one use it will crease, and the thinner it is, the more it will crumple. So wear it for short periods and only once – wearing the same linen item twice in a row will make you look like an old dishcloth – and hang it up afterwards to allow as many of the creases as possible to fall out. A smart, lightweight shirt will always be the go-to for me. Short sleeves are dated, unless done right – and they will cause tan lines, so wear with caution. As your wardrobe develops you might find it hard to throw away your old favourites, but over time you will learn not to choose anything that’s not on point. 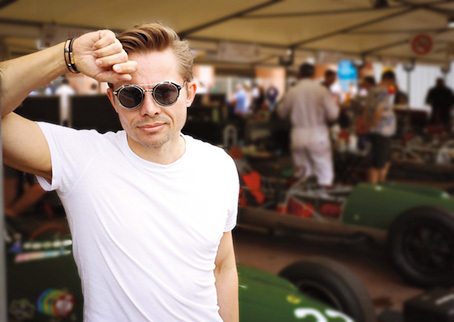 A note about sunglasses, as here’s where you can slip up considerably. Choose your shades to match your ensemble. Aviators are not suited to everyone, and neither are narrow glasses. Match your shades not only with your clothing choices but also the shape of your face. But please do leave at home your American trucker wraparound black sunglasses; they really do not have any place in your sunglass collection unless you are on the ski slopes, and even then proceed with care. Be mindful too that sunglasses can cause tan lines, so consider choosing narrow frames for the sun. Summer cocktail evenings can be chilly when the sun goes down. 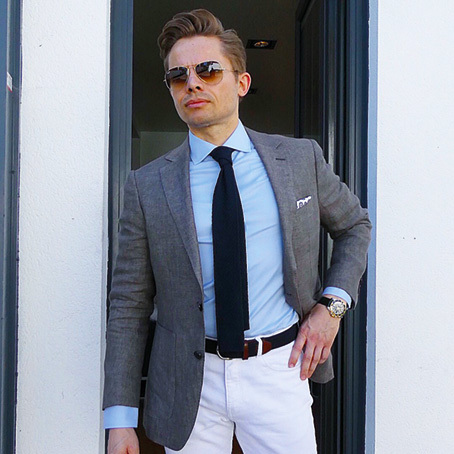 So opt for a summer weight blazer, white jeans and loafers, an open shirt and tasteful pocket square to remain elegant but warm, or a blue sweater tied around your neck over a crisp white shirt. Accessories are important too, so a quality belt (not the big flat square silver buckle variety!) tasteful watch, and a bracelet will mark you out as a gentleman who thinks about his look and his presence, and will grab the attention of everyone. When you’re going places to be seen, make sure you are seen as impeccable!